In an effort to crack down on gun violence, the mayors of the country’s three largest cities are banding together with the Brady Campaign and Center to Prevent Gun Violence to weed out what they refer to as the “bad apple” gun dealers. New York Mayor Bill de Blasio, Los Angeles Mayor Eric Garcetti and Chicago Mayor Rahm Emanuel signed a letter to Attorney General Loretta Lynch on Monday urging her to take action against those gun dealers, which – according to the Brady Campaign – make up only five percent of all gun dealers, but supply some 90 percent of the guns used in crimes across the country. The mayors – along with others who have signed the petition – are asking Lynch to create stricter guidelines and improve the investigations into questionable gun dealers and practices. 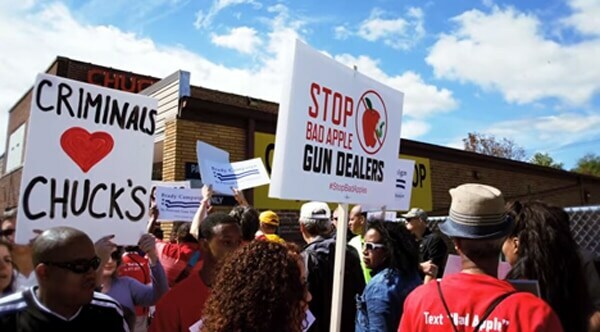 According to the Brady Campaign, many of these bad apples simply look the other way when straw purchases are made, allow customers to purchase in bulk, allowing them to, in turn, sell those guns illegally. Some are even accused of providing false information on sales records and altogether skipping background checks so that individuals who are prohibited from purchasing guns can still get their hands on one. De Blasio said these practices are “a national problem that hit close to home,” noting that four New York police officers were shot and killed this year by guns which were purchased elsewhere. The mayors’ signatures came the week after the sentencing of Jalita Johnson left her with one year of probation. Johnson purchased a gun for her boyfriend, Marcus Wheeler, who was a convicted felon barred from buying it himself. During a pursuit, Wheeler opened fire on Omaha police officer Kerrie Orozco, fatally striking her just above her bullet proof vest, mere hours before she was to take a deferred maternity leave to be with her daughter who was born prematurely three months prior. “What kind of message does this send to offenders in the future that will purchase guns for violent felons that are prohibited from possessing firearms?” the union proposed.